I’ve been looking forward to seeeing This Inspiring & Uplifting biopic, It has recently been released on DVD so I thought I would get it plus It’s got a great cast. 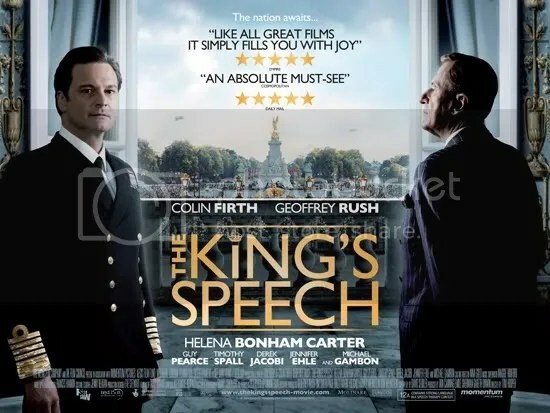 It Tells the story of King George V’s second son, Albert (played Coline Firth), who is second in line to the throne, but speaks with a stammer which he has had from the age of 4 or 5 and although he is a bright and temperamental person, some people harbour doubts about his fitness to be King because of this. So his brother Edward VIII is declared King instead, but is later forced to abdicate due to his involvement with an American Divorcee named Mrs Simpson, leaving Albert to be Crowned King. The film looks at his lifelong struggle to overcome his speech impediment, trying many different therapies over many years until he meets an unorthodox speech therapist named Lionel Logue (Geoffrey Rush), and Through a set of unorthodox techniques and much hard work he gradually makes progress and learns to speak in such a way so as to make his impediment a minor problem. in the process he & Lionel become lifelong friends and Albert is able to inspire Britain during the dark days of World War II. This exciting fast-moving 2005 thriller by Dean Koontz is next on my “to read” list. It is the story of an innocent man named William Wiles, an easygoing thirty-something, bartender who lives a quiet life, until a serial killer singles him out, not to kill him, but to force him to decide who his next victim will be, giving him a terrible choice between lovely blonde schoolteacher or an elderly woman active in charity work. So Billy pays an informal visit to an acquaintance in the Police force named Lanny Olson, he thinks the note is a prank, but then the schoolteacher dies. Then another note arrives this time the choices are reversed: if Billy takes the note to the police, a mother of two young children will die. If he doesn’t, an unmarried man who won’t be much missed will die. Lanny has to take this note seriously but the deadline runs out before he can make his involvement official, then things go from bad to worse when Lanny himself finds that he has become the killers’ next intended victim. This chilling thriller by Charles Maclean is also on my “To read” list. It is about a chap named Ed Lister whose world unravels when he gets news that his art-student daughter Sophie has been found brutally murdered in Florence. Frustrated by the Police inability to find his daughters killer, Ed takes the law into his own hands and sets out to find the killer himself. His investigations lead him to a mysterious website so he hires a young Cyber Slueth to track down a mysterious chap named “Ward”. The hunt for “Ward” follows a trail of bodies right across Europe and America, then it transpires that Ed might not be all he seems and that their might actually be a a dark secret linking him and Ward. I am a big fan of James Patterson’s novels and would like to read this tense & Exciting thriller, published in 2008. It features a smooth talking successful lawyer named Peter Carlyle whose family embark on a relaxing sailing holiday, until events take a turn for the worse during a violent storm and the family are lost, presumed dead. When he holds a heartfelt TV interview about his loss Peter appears to be a broken man, However all is not as it seems as it transpires that Peter is involved with a beautiful but dangerous younger woman and he may know more about the disappearance than he is letting on.